For those of you who like to combine needlework and travel, and whose travel dreams might be turned towards Europe this year, there are a couple nice events coming up worth taking a look at. And, of course, if you live in the general area where these events are taking place, you don’t even have to travel to get there! In any case, I’m not going anywhere! But if you are traveling this year and these would be a good fit for you, you might check out these needlework-related events. February 9th through 12th in Paris, you’ll find L’aiguille en fête, a great needlework festival in Paris devoted to embroidery, quilting, knitting, lace – well, all things needlework! I’ve never been, but every year, I daydream about going! If you can make it, you should! I hear it’s a fantastic event – full of needlework vendors, classes, workshops. And in Paris! Ahhhh. What more could you want? Real croissants, good coffee, and some needlework. The ideal vacation! 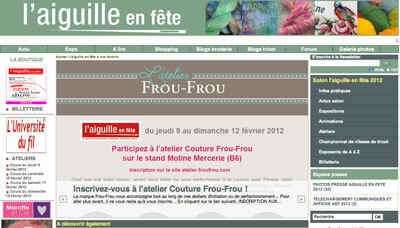 You can find out all about L’aiguille en fête on their website. If you need to read it in English, drop it in Google’s translator. 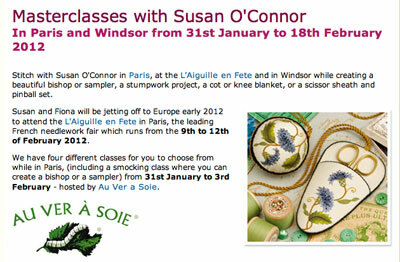 While you’re at L’aiguille en fête, you might want to sign up for one of Susan O’Connor’s masterclasses. She’ll be teaching smocking, stumpwork, and embroidery classes from January 31st to February 3rd. The classes are hosted by Au Ver a Soie, which means you’ll be exposed to some Really Nice threads. Now, I realize that’s a little last minute. Here’s something that’s almost last minute, too, considering the size and scope of this one, but if it’s in your realm of affordability, it looks positively dreamy! 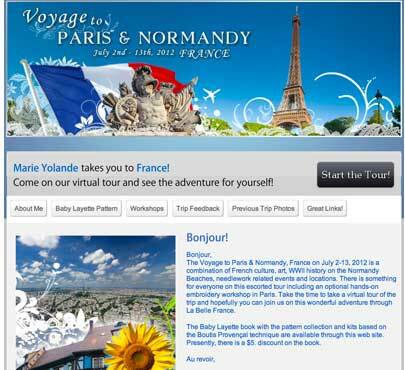 Marie Yolande is conducting a beautiful tour of Paris and Normandy this year, in July. It includes attendance at the International OIDFA lace conference in Caen, as well as an opportunity to participate in an all-day embroidery workshop at Maison Malbranche. Of course, everything on the tour is top notch and specially chosen by Marie Yolande for its excellence – hotels, cuisine, specialty tours, museums, and so forth. Doesn’t it sound fantastic? If you go, can I hide in your luggage? Do you have any needlework travel dreams? I have to admit, I do. They won’t be realized this year, but I sure do like to daydream about them now and then! Still, as much as I would like to while away the hours daydreaming about travel, I suppose it’s time to get the Saturday chores done. Funny. Doing laundry just doesn’t have the same appeal, does it? On Monday, I’ll share my weekend accomplishments with you! (Not the laundry.) I’m doing something Big in the workroom this weekend. I can’t wait to tell you about it! Oh, you’ve got me dreaming of going back to France now! How wonderful would it be to attend a needlework festival in Paris? Might just be something to save up for! The official OIDFA Caen congress is there: http://www.oidfacaen.com/ (clic on the poster to reach the information). I am the webmaster, I will enjoy visitors from all over the world! Mary, I grew up in Kansas and always dreamed of going to Paris! In 1999 my dream came true when I went on one of Yolande’s trips to Belgium and France. Since then I have been on two more trips with her and I cannot say enough good things about them. They are the perfect blend of mainstream tourist attractions and museums, exhibits, shops, and classes of particular interest to those who love the needlearts. And not only do you get to see the wonders of Europe, but you meet the nicest people. Having the dream is the first step to making it a reality. Who knows, maybe someone will make a point to send for you next year because they know you will draw other attendees? A little publicity goes a long way! I’ll cross my fingers for you. I’d love to see these events through your camera. Everyone points at different things even through the same lens. My dream is to take a silk shading class at the Royal School of Needlework in the UK. I’m hoping to realize this dream within the next 5 years. Of course if I was really rich I’d be heading to Australia for Beating Around the Bush…. I’m loving the AM series, Mary. Next week I’m going to Williamsburg for a white work and sacred monograms class. In either late February or early March we’ll go to Florida and I’ll squeeze in a couple of days of JE studio. Does that count? And in June the http://www.crewelwork.com/ , Phillipa Turnbull and many others will be at Lady Anne’s England and Scotland tour teaching crewel embroidery classes. This would be my dream. I dream about travelling sometimes, but don’t know if I will ever get off the North American continent. The lace festival in Caen is in conjunction with another, more local, one that runs biennially out of Bayeux. Speaking of which, I didn’t check the dates, but there’s a medieval festival where they demo lace making in Bayeux the first weekend of July. I’ve gone and love it. I’m waiting for the budget airlines to make it to Moldova so I can go explore those things again! The Paris festival is definitely on my list. How I would love to go to one of these festival?workshops but like Faith, I don’t know when I’ll get out of the US again. But, it does beg the question; with all the needlework lovers here in the New World, Why don’t we have one or more of our own that are of this caliber? You would think that at least NYC would have something. This is what I love about the internet. I, too, love daydreaming about these fascinating trips. It’s wonderful to learn about such great things going on elsewhere, and travel there vicariously. My husband and I decided, when our son was born, that we would skip the seemingly obligatory trip to Disney World and take our son to Europe. We had wonderful travels with him throughout Europe. I do so hope that the internet makes people realize there is a world of ideas beyond what is generated in the board room of the Disney corporation. I’m in awe of everything I see and read about on your blog, Mary. Thanks. We must all daydream around the same time! I was looking for Appenzell whitework embroidery tutors on Friday and finally found one – in Appenzell, Switzerland, of course. Just a couple of hurdles; mainly distance from Australia and most probably language but at least I’ve found someone is still keeping the tradition alive. Very heartening as I’d read that machine embroidery had replaced traditional Appenzell handwork. Like you Mary, this was one of my dreams and…I made a gift to myself after a year of troubles so I’ll be in Paris from 8th to 11th !! A piece of advice for those going : be there on the first day to make sure you still can buy what you want/need. Many exhibitors have their best products sold out after the first day (if not at midday !). The second thing is to stay after 2PM : most of the ladies have to leave to get the children from school and leave you almost alone with a lot of space to reach the stands ! It’s going to be one of my best days in the year ! I will not forget my creditcard (promised) and will not look (too much) at how much I spend. The thing is that in Europe there are less and less places where you can buy what you need for REAL embroidery (and NO place in Belgium). Luckilly, we can buy on internet on base of advice given buy people like you. I’m day-dreaming and laundrying too, as you do. BUT at times I definitely DO indulge in some real travel for a change. Last spring my husband and I went to Bayeux, Normandy (250 miles away from home, isn’t it a REAL shame ?). I had been dreaming about it for YEARS (sigh). After musing on it for some time, I also visited Chantal James’ delightful little shop and bought two kits, one of which I finished and gave to my ‘Mediévaleux’ brother as a Xmas present. The linen cloth and fine wool coming with the kit were very nice to work with. It was so much fun to learn a brand new technique ! We do have marvels in Belgium too. For example in the Lace and Costume Museum (Brussels), hosting an awesome collection of lace and embroidered pieces, of which ecclesisastical wonders. All I hope is that you’ll find the time and opportunity to indulge into some travel too ! Next Next post: Kitting Up!